You are here: Home / Call to Action / AB 186 – Safe Injection Sites Passes Assembly – Now What? AB 186 – Safe Injection Sites Passes Assembly – Now What? Update: AB186 comes up for a third and final reading TOMORROW, August 21. Remind our elected representatives why they should be voting NO to this bill! It needs 21 votes to pass, and Bill Monning has already advanced it from Public Health Committee. EMAIL, CALL, MESSENGER PIGEON if necessary (allow flight time). If this goes to the Governor’s desk it has a very real chance of making our beloved town the first legal heroin injection site in the COUNTRY. See document below for current tally of City/County representatives who have not taken a position (we can only assume they support) on AB186. Please contact them as well and encourage them to fight this in whatever way they can on behalf of Santa Cruz County and City. AB 186, which allows certain counties in California to operate “Safe Injection Sites”, passed the California Assembly on June 1st with 41 Ayes and 33 Noes. Our Assemblymember Mark Stone voted yes. The bill moves onto the Senate. CALL, EMAIL, FAX, WRITE! The ball is now in the Senates’ court. 2). Do you support the inclusion of Santa Cruz County on the proposed Safe Injection Site pilot list? Results of our brief survey and their responses may be found in the document posted below. This young addict sells crack cocaine and uses the money to feed her own addiction. Here, on the sidewalk of East Hastings Street, she injects heroin. Insite, the supervised injection site, is only a block away. Insite — and the concentration of services surrounding it — has turned an already blighted neighborhood into a disaster. Without an equal focus on prevention, treatment and enforcement, we can expect the same in Santa Cruz. 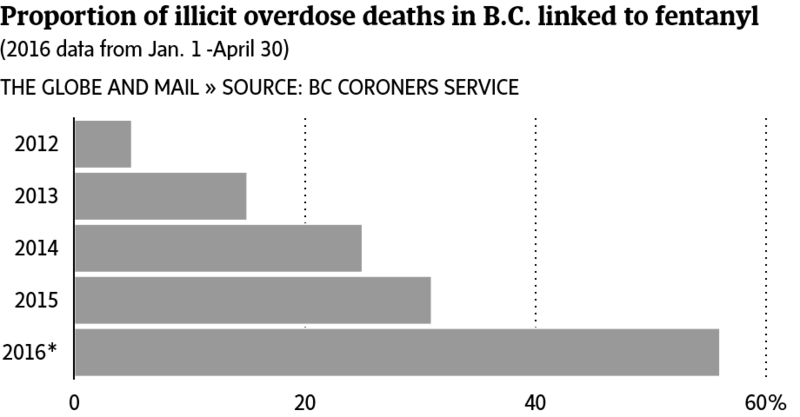 Safe-injection sites are good at what they do. But they really only do one thing: prevent people from dying. Street disorder breeds crime in the 00 Block of East Hastings Street. 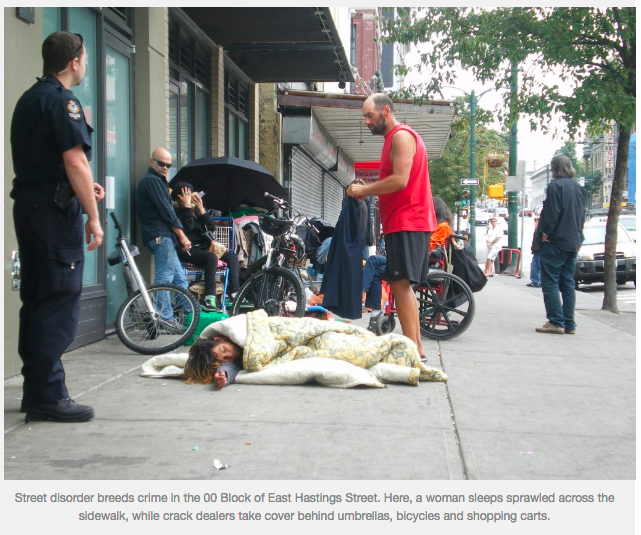 Here, a woman sleeps sprawled across the sidewalk, while crack dealers take cover behind umbrellas, bicycles and shopping carts. I am a native Santa Cruzan, and I am so sad to see the state of our town, but it angers me to hear that our city council’s inability to take a position on AB 186 puts our town in risk of becoming even MORE unsafe! I used to avoid the downtown area, especially at night as I always felt unsafe. This is very unfortunate because there are such amazing stores, restaurants and entertainment venues downtown, but I often opted out due to previous bad experiences of being hassled, or aggressively pan handled. I’m not a wimpy person, at all, but my philosophy in life has become, why put yourself in harms way when it isn’t necessary? Well, it has “become necessary” as I have worked downtown for the past two years. I get to work at 5:30 am and have to walk a block to my office, and in this short distance I have been so frightened of the interactions I’ve had with pissed off addicts who are coming down from whatever their substance of the night was. I now walk with pepper-spray every morning, and unfortunately have had to announce that I’m ready to use it at least 5 times. Once I’m safely inside my locked building, I have to take stock of who’s outside our building as there are known characters who are always wasted and abusive. We call s.c.p.d. on the regular, but even if they do take the really scary people away, they are back in 2 to 3 days. The summer has brought in a crowd of addicts that are so brazen and act above the law. They sell drugs out in the open, right in front of our building and they do not try to hide their actions when people walk by. Most times I will use the back door to exit the building as I do not feel safe walking out amongst the riff raff that hangs out in front of our offices. 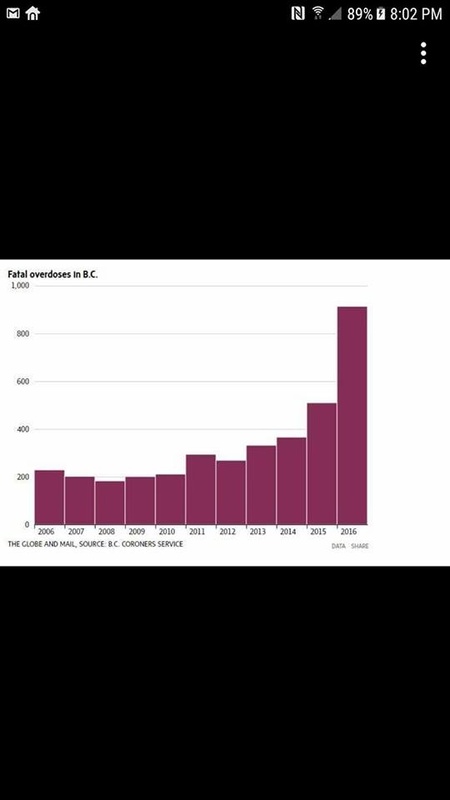 I’ve also noticed in the mornings, the amount of homeless addicts that are sleeping on sidewalks or in an agitated state of mind is increasing rapidly. I bring all of this up because it’s obvious Santa Cruz is known very widely as a “lenient” town, but if these safe shoot-up rooms are erected in our town, the number of drug/substance addicted people WILL increase even more rapidly. I don’t understand why the money and energy isn’t being directed into MENTAL HEALTH and addiction programs. I have first hand experience with the lack of mental health facilities available in Santa Cruz. My brother has been living with mental health issues for 30+ years in Santa Cruz, and since the 80s, the facilities have slowly closed; and mental health facilities are almost non existent in Santa Cruz now. Why aren’t we focusing on this issue, instead of providing a safe place for people to shoot up? I truly believe that rolling out the welcome mat to drug addicts by providing safe shoot up rooms would be devastating to Santa Cruz, which is already overwhelmed with addiction issues, lack of mental health facilities, burglary/theft, and a large homeless population, and no solutions on the horizon. If you DO support the safe shoot up rooms, at least have the fortitude to stand up and say what you believe, instead of sitting on the fence and letting things just “happen”. Thank you Gina! Totally agree. All city/county officials who have the authority to vote on Santa Cruz being a ‘safe site’ need to show up, stand up, and speak up…not sit back in a weakness to show your face and say what you think. Geez people, you can’t hide. By not taking a stand publicly, you are showing us your weakness. Sorry, but as city/county officials, you ALL need to take a stand. How much worse will you allow Santa Cruz to become? We are already infested with drug use and its abuse. Hang out at Denny’s on Ocean for a bit and see the interactions. What do you think would happen if this was placed in a middle-class neighborhood, or, ANY Santa Cruz neighborhood?